What do I mean by income? I mean the income left over at the end of the year that you pick up on your tax return. If you are in this for the long-haul, you want to keep that income as low as possible. Why? #1 is income gets taxed. If you sit on $200,000 income at the end of the year, half of it might just go straight to the government. Instead, allocate a high amount into growing your business. I would easily take more than $100,000 of that and put it back into the business. Don't blindly invest in the business. If you do not know what to do with it, invest in yourself. Go to events and seminars, take some courses in areas you might feel you could learn the most. If you are just getting started, go to dropshiplifestyle.com. We have courses that get you up-and-running as well as an option to have us build the website for you. Interested in our retreat in Prague? Email me at [email protected] for more information. 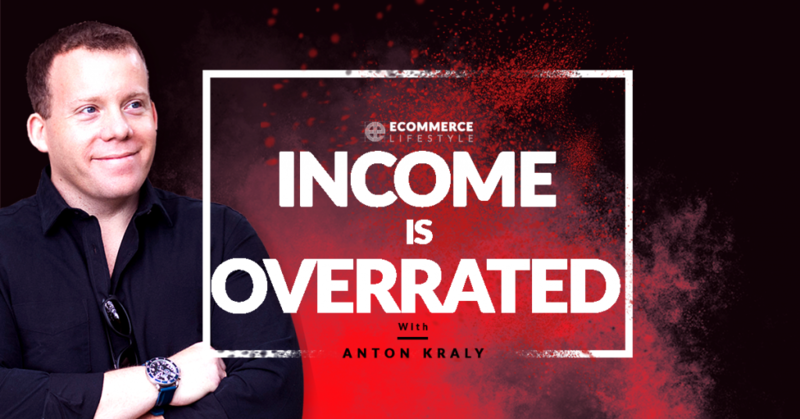 Hello everybody, Anton Kraly here from ecommercelifestyle.com and welcome to another episode of the eCommerce Lifestyle podcast. So I'm curious. I know this episode probably sounds a little different than most of them that I do and that's because typically I'm recording them on my phone on the way into my office or when I'm driving anywhere and right now I'm actually recording this one from the office on a microphone. So let me know, go to ecommercelifestyle.com and click on Episodes. Let me know if this sounds any better and I don't know I'll probably, if anything, get an external mic to use on my phone but I'm probably still going to record the majority of them from there. I just figure for this one, it's kind of early. I'm in here working out some numbers in the office, just I like to come here to work out, honestly anything that has to do with finance because I have massive whiteboards everywhere and it makes it really easy for me to get all those ideas and all those thoughts that are in my head and map it out and make sense of it all. There's one thing that I've been thinking about which is ... I don't want to say it's basic, it's something that you learn early on as a business owner, but it's something that I want to share to everybody listening to this that might be at that stage in their journey, right? Maybe even not, maybe you've been around for a few years, maybe you're making really good money but what I want to talk to you about today is how income, income itself, is really overrated and what I mean by that when I talk about income, I talk about the money that's left over, that your business profited at the end of the year. Now, this is the money that if you are either a sole proprietor or an LLC will just pass through directly to your income statement and this is the money that if you an S corporation that you either pay yourself through payroll and then also the money that you pick up as distributions, right? So the actual profit. I'm not talking about top line revenue, I'm talking about income left over at the end of the year that you pick up on your tax return and why it is overrated because I'm guilty of this myself. When you're first starting out and you're thinking, I'm going to build my business, a lot of people have income goals in mind. You know, "If I could make $200,000 a year. If I could make $500,000 a year. What if I build this thing and I could make a million dollars a year in profit in my bank, how cool would that be?" Right? Here's the thing. It sounds cool but if you're really in this for the long term and you really want to build something that can grow exponentially and if you really want to build something where you could be number one in your industry, guess what? You don't want income until either you're preparing to sell your business or until you decide you need the money. Now, here's what I mean by that. You want to keep that income as low as possible. There's a few reasons why. The one of them that's probably the most obvious is that income gets taxed, okay? So listen, I'm not saying you shouldn't pay taxes, I'm not saying you should do anything shady. I understand that taxes support our government when they decide to work, and that yeah, they're necessary, right? So yeah, I still pay tax. I'm not saying don't pay taxes but if your business, let's just take a hypothetical number, if your business made $200,000 net profit this year, then in most places in the States, let's just choose an even number and say 50% of it, is going right to the government. So if your business made 200K in profit, then all of a sudden, again we'll just choose round numbers here, 100K of it you could wave goodbye to because now the government has it. So they're your business partner basically. Now, why would you want that to happen, okay? Because then you get $100,000 and then you have your $100,000, maybe you live off, let's call it $70,000. Then you take the remaining $30,000 and maybe you invest it after you've paid taxes, to who knows? A mutual fund that maybe gets you 6% or 7% interest per year. Again, after you pay tax on your money. So that's kind of best case scenario. What a lot of people do is take that remaining money and they put it into a savings account where best case scenario you're getting what? 1%, so like nothing. There's no money in taking money out of your business and trying to put it somewhere traditionally that people put it. Again, having it sitting around in your checking account. Having it sit around in a savings account, or being in a mutual fund? That's probably the best option that you have once you have the cash if you're looking for a traditional investment, but the point is that you're not a traditional investor, you're a business owner. If you're a business owner and if you really have a business you believe in, then it is your responsibility to grow that thing to be number one in your industry and the only way you're ever going to become number one in your industry is by growing your brand and by growing your reach and by making sure that everybody knows who you are. So hear me out. Let's just say again you're in your first year of business, maybe your second year in business, whatever. Your business at the end of the year would show $200,000 net profit after all your expenses are paid, well my advice, instead of taking that $200,000 of profit, is allocate another $100,000 of it, or maybe more, ideally I would spend more of it, into growing your brand. So how do you do this? Well, maybe you're investing in things like different PR, maybe you're buying more paid traffic, which is where we invest a lot of our money, right? We spend money to grow our brand because it's not just going to happen organically unless you're some kind of unicorn. You need to pay to get people to know who you are until you hit a certain threshold where everybody just will. So again, instead of just taking that $200,000 net profit, maybe another $100,000 of it that you would normally give to the government in the form of taxes, you give to Facebook and to Google and to different influencers and people that write about different companies. That way, it's all written off of your top line number and not only are you paying less tax because you have less income, remember income is overrated, so not only are you pay less tax on that because you have a lower income, but now your brand is growing like crazy because you're putting the money in the right places. So it is easy to get caught up. I say things a lot, like with Drop Ship Lifestyle in my eCommerce training program, which you should check out, I'm sorry, dropshiplifestyle.com, click on Courses, see which one's right for you. We have our premium training courses, we have a done for you option, where we literally will build your website for you, we'll set up your traffic, we'll set up all your analytics, we'll set up your social media. Again, if you're interested in that, go to dropshiplifestyle.com, click on Courses in the top navigation menu. But the point is, in that program, I typically recommend people try to maintain a 30% net profit and here's the thing, I still recommend that, right? So you get a $1,000 order, you make $300 net profit, that's great, that should be where your numbers are, but still my advice would be that other money out of that 30% profit, you could take more of that when you're in this growth mode, which honestly I think most people should be in if they really believe in their business. Take that money and put it into growing your reach, into growing your brand. Now, let's just say you're listening to this right now, right? And you're thinking, "Anton, that sounds great but my business is going to make $200,000 this year net profit and I have no idea where I could spend some of that money into growth. I just don't know where I would put it. I don't know how to build my brand any more so I don't want to just throw it away." Trust me, I'm not saying just take that extra profit and throw it at Facebook and throw it at Google and see what works. That's the last thing I want you to do, right? At that point, just give it to the government. So don't do that, but what you should do then in that scenario is invest in yourself first. So invest in things like different education so you can become a better business owner and a better marketer. Invest in different courses so you can learn what other people are doing that have already been there and done that. Invest in different events and seminars, and conferences. We have our Drop Ship Lifestyle Retreat, it's coming up in Prague, September 5th, 6th and 7th. If you don't have a ticket for that yet, email me, anton, A-N-T-O-N, @dropshiplifestyle.com. I'll tell you how you can come out there, it's just a place where you're going to learn, again directly from myself and other people that have been there, done that. So invest in events. Invest in different masterminds, invest in books, right? Just read. Listen to podcasts like this but put your money places that it's going to get you a better return than again, what it would if you gave the government half and then put it in the savings account where you then get 1% of half of your money, right? That's not how you're going to grow a business. So again, my advice is that income is overrated. You want to have your income as low as it possibly can and you want to be taking the money that your business is making, invest it in yourself so you can become a better business owner. Invest it in your brand so that everybody knows who you are and your business just grows on itself. Then of course, once you get to a certain threshold and you're really at the point of, "Okay, I can't just keep spending money, I need to know where to put all this profit that my business is kicking out at me." Literally you have the problem of having too much money. Then at that point, I recommend investing into different liabilities but putting your money in different places that it can grow over time as well but don't just be pulling it out because you think, "I want to make $500,000 a year." It's the dumbest thing and of course it sounds great to make that much money but listen, there's a reason a lot of very, very wealthy people, when you see their tax returns and their actual profit that they're taking out, it's not that much money. It's because it's going into activities that are growing their businesses even bigger, because they understand this concept of income being overrated. So keep that in mind. Again, if you're not part of my eCommerce program yet and you're just getting started, go to dropshiplifestyle.com, click on Courses, you could see my premium coaching there and you could see our done for you option where we will build your website for you. Also, if you're part of Drop Ship Lifestyle, you want to come out to our 6th annual retreat, going to be in Prague September 5th, 6th and 7th. Send me an email, it's Anton, A-N-T-O-N @dropshiplifestyle.com and I'll let you know how you can get your ticket and come hang out for three days in my favorite country in Europe, my favorite city in Europe I should say. So thank you everybody. Again, I'm at the office, so I am going to dive into some analytics and keep looking further on how we can grow while taking less money out of the business. So thanks everybody and I'll talk to you in the next episode of the eCommerce Lifestyle podcast. See you.